Discussing about language acquisition and language learning there are a number of theories. Some of theories have tried to explain the definition and the different between acquisition and learning. Language acquisition means process of child use in acquire first and second language. Child do interaction in target language to concern on massage not on form of utterance. While, SLA (second language acquisition) tend to focus on speak production and language comprehension. A simple example of language acquisition is while a child acquire language. How a child can speak a mother tongue. In the beginning child in acquire a language use physical respond, they acquire a language unconsciously. Child tried to communicate meaningfully without concern the form in delivering a message. The are not aware if they are acquiring only aware the fact that they can use language for communication. In order to correct the mistake only imitate the correction without understand the rule. Language acquisition also called as implicit learning, informal learning, and natural learning. Language learning or usually imply on second language (L2) is a conscious ways to learn second language. Learn language knowledge consciously use a certain method or learning process. A learner know and aware learning about rule, grammar in formal learning in an explicit learning. In second language (L2) learning is able to follow child ways in learning first language (L1), child use the language to represent their conception. Language learning means transforming conception into perception. To distinguish between those theories are difficult because the purpose is same to master a language. But actually there some different. 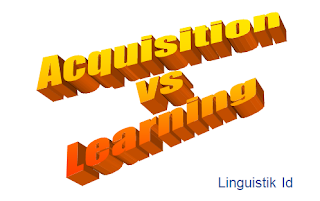 Acquisition means acquire a new words/ sentences / language unconsciously (tidak sengaja). Kids acquire the language without taught other / teacher, the find new term which use others even it not taught. For instance a kids hear a new sentences like command sentence e.g : “erase the white board”, a teacher never teach the command only ask the student, whereas the students hear, use, and remember it means the student acquire the language. It is not only applied to kids but also adults. Language learning means learn a language consciously have done by learners. The learners can use the language after they teaches the language. Some of theory explain that children acquire the language while adult only can learn language. In error correction : in acquisition has no effect on subconscious, usually parent will correct child mistake in small portion like on pronunciation, verb, and dirty words. This correction does influence greatly. but it will be useful for conscious learning. Because error correction will help learner understand the rule or form. Direct method is kind of language learning method, in this method learner and native speaker must meet. ALM method: Audio Lingual Method or Army method is a method to learning language by heard a recorder of certain language. It is called as Army method because it is the first time used by US army to learn Vietnam language in short time, but this failed because there was a number of words/ vocabularies which not available in the recording. CA (Contractive Analysis) tried to find similarity and different of language teaching. Only the different in certain word, sentences, phrase which different from Indonesian who teaches. If it similar not need to be taught because the learners have understood. Error is part or process of learning. Students don’t understand after do a mistake / error to be understand or dari tidak bisa menjadi bisa. Therefore Error tidak perlu di besar – besarkan. Don’t concern in students error. An error in language learning called as Inter-language (bahasahantara). There are a number of teaching learning method. There are no which the best. Each method has their advantage, the teachers may combine 2 or more method to students appropriately. References : Summary of Chapter 1 of Kharsen, Stephen D. 2002. Second Language Acquisition and Second Language Learing. University of Southern California. 0 Response to "The Relation of Theory to Practice Acquisition vs Learning"